Alistair is a solicitor in our dispute resolution/civil court team, based in our Glasgow HQ. Alistair joined Inksters following the completion of his undergraduate law degree at the University of Stirling and continued to work at Inksters while studying for his Diploma in Professional Legal Practice at the University of Strathclyde. 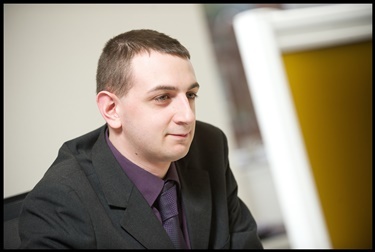 Upon completion of his Diploma, Alistair continued with Inksters as a Trainee Solicitor working with both the property and civil court teams. At the conclusion of his traineeship, Alistair remained with Inksters joining the Dispute Resolution / Scottish Courts team. Alistair is available to undertake a wide variety of civil dispute resolution matters (including Debt Recovery) and is happy to undertake cases in courts and tribunals across Scotland. Alistair regularly appears in Sheriff Courts throughout Scotland and has also appeared in the Sheriff Appeal Court; he also has experience of the Court of Session and the Scottish Land Court. Alistair is available to meet with clients at any of our offices, and also at our visiting base in Lerwick. Alistair also has an interest in Information Law matters, which adds to the overall niche services provided by Inksters. Alistair’s interest in information law extends to both Freedom of Information and Data Protection / Privacy. While undertaking his traineeship, Alistair also studied for his Master of Laws degree during which we studied and wrote about the Information Commissioner’s practice concerning monetary penalties for breaches of the Data Protection Act 1998. He has knowledge of the procedures and practice of the First-Tier Tribunal (Information Rights) and the Upper Tribunal (Administrative Appeals). Outside of work, Alistair spends a lot of time volunteering for a number of charities and is currently a Trustee for two charities; he also enjoys reading and listening to music. Contact Alistair Sloan on 0141 229 0880 or send Alistair an e-mail.